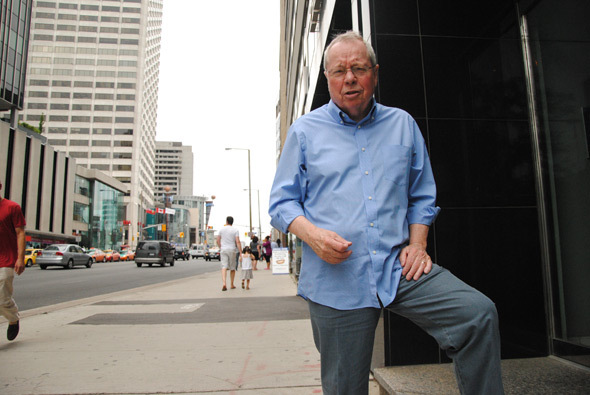 David Crombie was elected mayor of Toronto in 1972 on the wave of a reform movement opposed to the rapid and often unchecked growth the city was experiencing during the 1960s. Citizen groups, ratepayers associations, and neighbourhood committees proliferated, which were generally supportive of democratic reforms, and opposed to expressways and the zoning of residential neighbourhoods for high-rise development. Crombie stayed occupied the position until 1978, and as mayor, held the balance of power between city council's pro- and anti-development factions while working to improve civic participation and planning in Toronto. After completing his term, Crombie left City Hall for federal politics, winning a seat in Toronto-Centre as a Progressive Conservative, which he kept until 1988. As an MP, he held ministerial positions in the governments of Joe Clarke and Brian Mulroney. 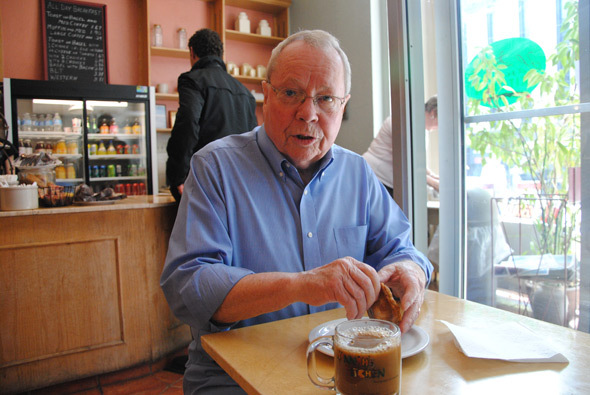 Since then, Crombie has returned to urban affairs through his company David Crombie & Associates, his chairmanship of the Toronto Lands Corporation, the Nuclear Waste Advisory Council, and other organizations. In 2004, Crombie was made an Officer of the Order of Canada. I sat down for a conversation with him the other week at Hanna's Kitchen, near his condominium at Yonge and Eglinton. We talked about the mayor's race and some of the most important issues facing Toronto. 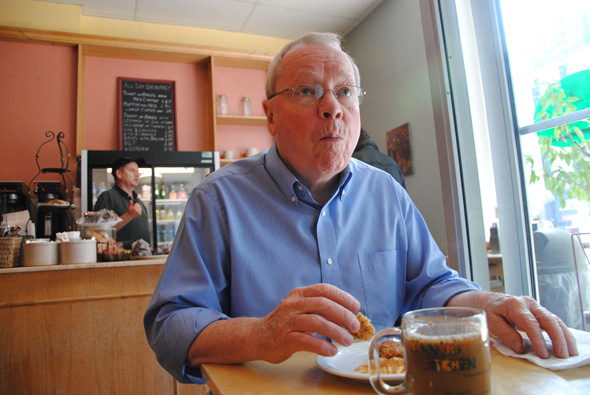 Crombie refused to endorse anyone for mayor but said that the municipal government's disconnection with civic society will be one of the most important issues the next mayor will have to deal with. And, in the spirit of the reform movement of the 60s and 70s, he spoke energetically about the need for government to respond better to the wishes of communities who want to take control over the municipal services they use, such as parks and pools. What did you like most about being mayor? [During the] 60s and 70s there was a tremendous sense of trying to reform the city. We rejected the American model, which said everybody lives in the suburbs, you work downtown, at dark [downtown is] left to the cops and muggers, and you don't really need a downtown you just need a lot of expressways coming and going -- that was the model we were presented, and we thought it was fundamentally flawed. What's the biggest challenge facing this city right now? So I think the biggest thing for government to catch up with is its own citizens, and its own civil society. That's the largest thing. ...I think [the mayoral candidates] will find themselves having to pay attention [to this issue] even if their natural instincts don't advise them too, because their constituents are going to be insisting. What do you make of the mayoral election so far? The election will begin shortly after Labour Day...It's too long, but what it does is allow everybody to limber up a lot and gauge the competition, try out a few things, get your team organized and all that, but most people aren't paying attention. So any polls now are pretty wild. There are a couple of things that I look for. I look for somebody that's got a sense of the history of the place, because I believe that history is at work no matter whether you're paying attention or not, and it informs a lot of what people's expectations are, what their hopes are, and all of that...So if they don't know anything about the history of the place, I'm a bit worried. The TTC has been heavily criticized recently by riders for a variety of issues. Is our transit system off track? I'm a big defender [of the TTC] and I get just as mad at it as other people when it's not working the way I want it to work. But I have a son who lives in New York, and he comes in here once in a while and just loves to go on the TTC. Why? Because in New York they say 'oh, by the way, we're not hitting the following stations, get on another line, go over here, etc.' Here you get the subway every two or three minutes...he can't believe it. So, again, if you look from the outside, I think you'll find that by and large the TTC is still a great blessing to the city. So what explains all the unhappiness about the TTC? The reason people are concerned about it is because they expect it to be excellent. I use the TTC all the time and I've been in every station and I used to take streetcars and the buses, and I used the GO, so I'm a little bit of a one person expert on it. And the problem is you're walking into a station, and there are areas they just don't bother cleaning any more. People have respect for it if it's clean, neat, well organized, and people say good morning. But if it's dirty and the [TTC collector] guy doesn't look up from the paper and doesn't give a damn if you're on his radar or not, then people don't respect it, so it's not so complicated. So do they have an attitudinal problem with some people? Yes. Should they have corrected it already? Yes. What do you make of the province delaying funding for Transit City? I think they're going to have to cut the costs over the next little while. We don't have enough money. They're going to have to restructure Transit City. Whether they call it Transit City II or post-Transit City, or whatever they want to call it, they have to work with the province and Metrolinx, and they have to construct a capital program that they can afford over the next fifteen years. That's why I didn't understand [the city's] actions when the province said 'look we don't have enough money so we're going to stretch it over, whatever it was.' People are disappointed, but it's hardly a capital offence. Or maybe it is a capital offence, but they don't have the money! Since amalgamation, have we done a good job of integrating Metro's municipalities? No, we haven't...It's not just policies and rules, it's people. But did the library do a good job? They did an excellent job. The library system in this city is extraordinary and nothing can match it in North America. We're way ahead, and everybody in North America knows it. We had six library systems, including a Metro one -- they were all amalgamated and they have gone from success to success. They built new libraries and fixed up old ones, increased the quality of the delivery of the service, and have done all kinds of stuff for people whose income is stretched. They've got lots of computer stuff, and they've got interest in local history. It's a champ. How were they able to do it and yet it didn't happen in other places? That's what's got people thumping away: it's amalgamation, they say! No it's not. The difficulties have been with an inability to deal with amalgamation, that's the problem...It was easier for people to complain than it was to actually do something. Especially downtown, but also all around the city, there's been an explosion of new condo developments in the last 10 years, is this a good thing? Oh sure, we're building a vertical city. I lived forty years up the road on Glencairn Avenue, and now I live in a high-rise condo. Everybody in the neighbourhood was against [building tall condos at Yonge and Eglinton], but they're absolutely splendid. Finally, what do you make of the G20 in Toronto? [Laughs]. First of all, [maybe] they should have held it on a boat somewhere...I think such an event is too big. You're better off getting a big boat and helicopter-ing people out to it. Secondly, they just let the costs get away. Are these things expensive? Yes they are. Are they 20 times more expensive than they were before in some other place like London? No. To me, the fake lake was the biggest insult...It's bizarre, it's not a good idea, and very badly executed by a government that doesn't give a damn about Toronto.